“By 2022, 40% of BCM programs will be subsumed into the digital business risk management structure rather than exist as separate practices,” says Gartner. Find out more about these and other security and risk management trends in Gartner’s report. Download a complimentary copy today. 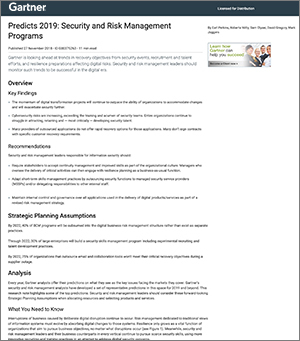 Predicts 2019: Security and Risk Management Programs, Analyst(s): Earl Perkins, Roberta Witty, Sam Olyaei, David Gregory, Mark Jaggers, 27 November 2018.